These days, memory events have been held in connection with Jewish persecution during World War II many places in the world. Recently, a small group of English Jews would remember not only the Holocaust, but also the many Jews who through the story were murdered and massacred by Muslims. 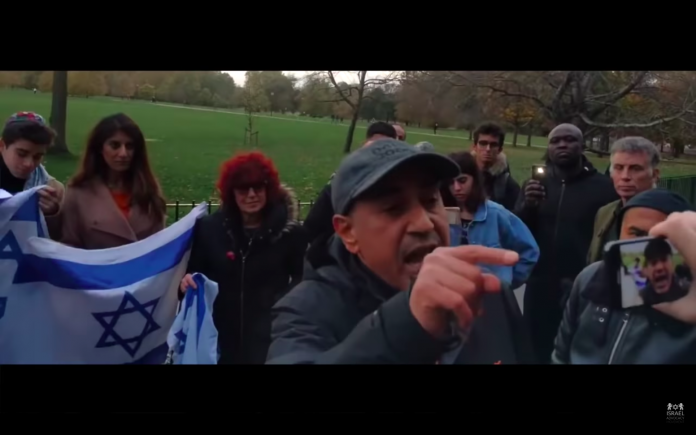 They gathered on the symbol of freedom of expression in London, Speakers Corner, but they did not get there. A large group of Muslims quickly gathered around the few Jews. Something called “Death to the Jews.” An older man ruled out loud that the Holocaust had taken place. When a young Jew began to read the long list of Muslim assaults against Jews, from the Prophet Muhammad, the beast had 900 Jews in Medina in 627 and 90 in Khaybar the following year, until 1967 when two Jewish families were slaughtered in Tripoli, at least 18 Jews became killed in Libya by a raging Muslim mob, and 57 Jews were killed in Syria, the threats were so severe that the Jews had to give up. The video below shows what happened. Around 5 minutes inside the video, you can see how Muslims disturbed memory celebrity.